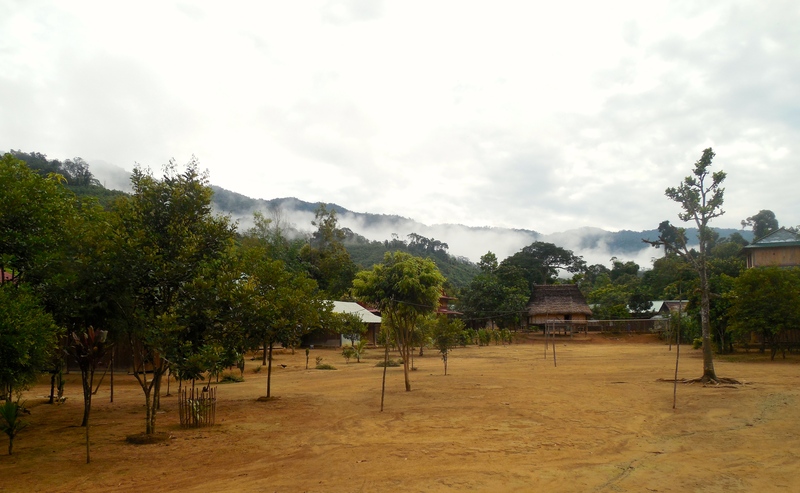 After five hours of hiking through the mountains we arrived at the remote Katu village of Aur (pronounced “ahh-ool”). I had been looking forward to this visit for weeks: This was the same village I had visited two years ago, when I had first encountered the Katu, where I had first encountered the ghost of the Saola. We straggled into the village in the early afternoon with the tropical rays falling vertical and white-hot. The open bare-earth courtyard was nearly-deserted: Here and there a villager darted from one hut to another, the barest smudge of a shadow trailing behind. A village elder directed us to place our bags in the central communal hut. He said we would also be sleeping there. I had never been to the communal hut before: last time I had come here I had slept in one of the normal village huts that ring the courtyard. There was something special, I felt, about the central community house. We walked to the oblong-shaped thatch-roofed hut and stepped inside. It took a moment for my eyes to adjust to the cavernous darkness, but when they did, I was greeted by a fantastic sight: row after row of animal skulls, most of them decorated with war-paint-like markings, lined the upper walls almost to the very top of the ceiling. It was a testament to how deeply-entwined the Katu culture was to the surrounding forest. For the Katu, the animals were spiritual entities, necessary for providing sustenance, but to be respected and worshiped. It was also a treasure-trove for a biologist: here was a snapshot of the large mammal community in the region: at a quick glance I saw serow, macaque, wild pig, muntjac, and sambar. I spend the better part of an hour taking detailed notes before the exhaustion of the hike overtook me and I lay down to sleep. The last image I remember before drifting off was the empty stare of dozens of painted death masks glaring hollow-eyed from the panels above. I awoke in the early evening to the bustling sounds of Katu village life that I had come to know and miss. I thought back to the last time I had spent time with the Katu, which was when I surveyed Xe Sap: they had taken me into their homes, a complete stranger, and made me feel like one of them. I yawned and groaned and looked outside: the courtyard was alive with barefoot children running and screaming after an under-inflated soccer ball, women chatting as they came back from the fields in knots of twos and threes, men clumped together outside the huts passing around rice wine and guffawing to raucous jokes. I could see Sang, the WWF Forest Guard working with us, outside one of the huts. I stepped outside, pausing to marvel again at the lively courtyard scene—so much life crammed into such a small space—then walked over to the hut where I had seen Sang. He was inside now, sitting with a group of villagers, passing around a bowl of home-distilled wine. 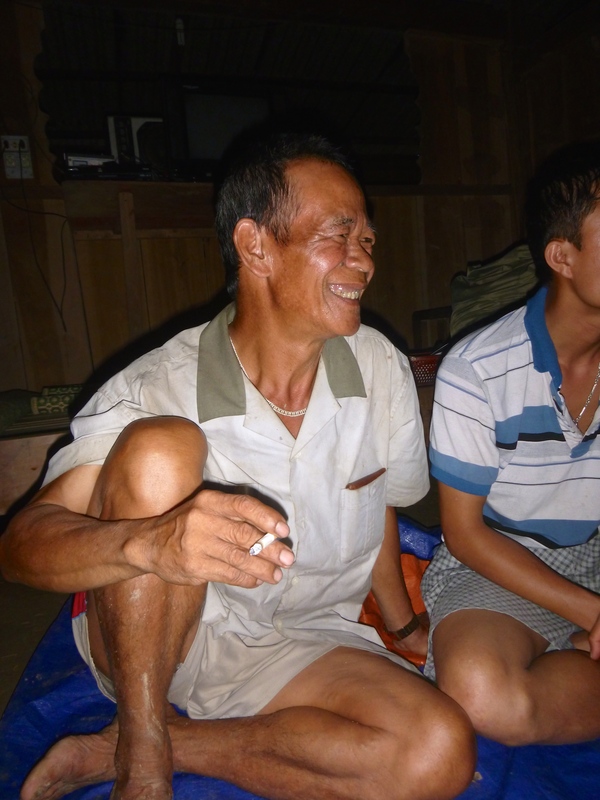 And next to him was a face that I had not seen for a long time: Mr. Tren, the village headman. On seeing me, his sunned face split into a toothy grin, the kind of grin that makes the eyes crinkle at the corners, the kind of grin that you can’t help but reciprocate. He swatted the ground beside him and I squeezed into the circle. The bowl of wine was thrust in front of me. I took a gulp and felt the welcome double-punch of Katu liquor and hospitality. It was nice to be back among old friends. 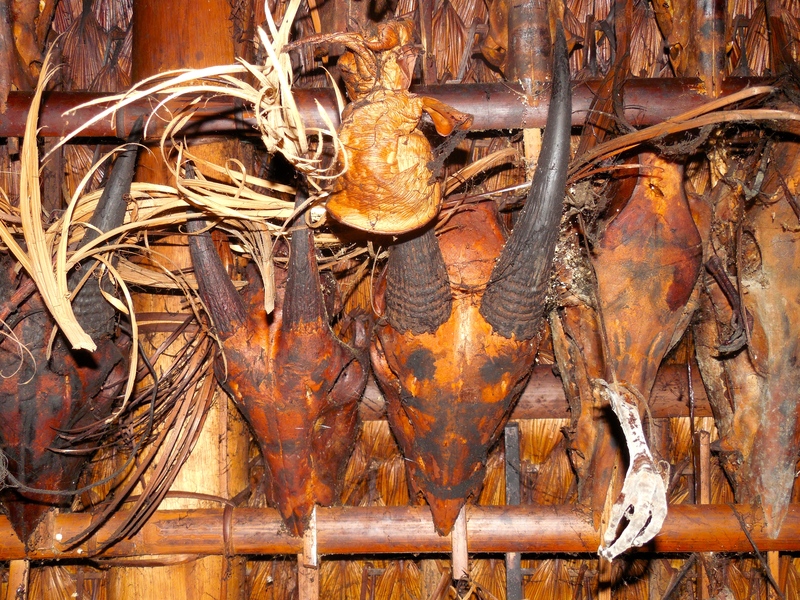 After my fourth or fifth sip of rice wine I felt enough liquid courage to ask Mr. Tren the one question that had been on my mind since I learned we were coming to this mountain village: Could I see the Saola trophies? He smiled and laughed and clapped me on the shoulder. … and did you see it, the Saola trophy? Drew – if nothing else, your sojourn in the mountains is helping you hone your writing skills. Your writings are becoming much more fluid relative when you started. I’ve got a book with vignettes from various vignettes by explorers/adventurers. I’ll get it to your Mom. Thanks for the compliment — and will look forward to the book!